Westinghouse brakes on vintage cars 1927. Homepage. This page: An interesting booklet published in 1927 and distributed at the Motor Show in Olympia. Westinghouse Brake & Saxby Signal Co. Ltd booklet. This smart booklet was produced by the Westinghouse Brake & Saxby Signal Co. Ltd, and taken to the 1927 Motor Show held at Olympia in London. There it would have been handed out to a passer-by, either a member of the public or possible a trade contact. Either way, it's quite rare for booklets like this to survive for so long, especially in good condition. 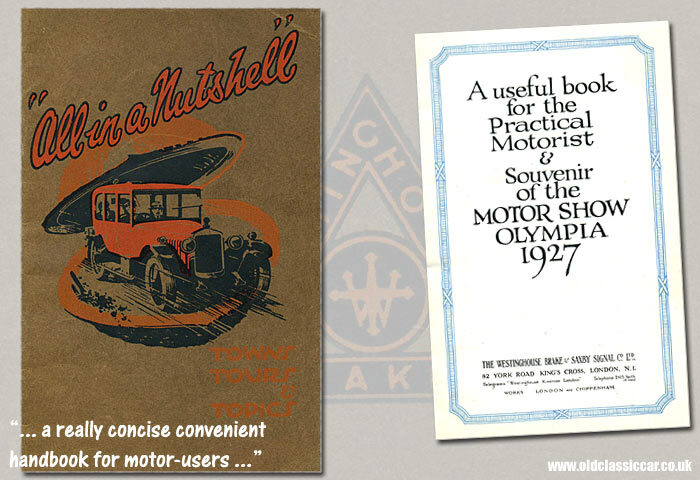 It's titled "All in a Nutshell", and features on its cover an illustration of a vintage motor-car being driven out of a nutshell. The subtitle reads "Towns, Tours and Topics" and sums up the contents of this publication. It will be noted that the style of the Company perpetuates the memory of two great inventors, George Westinghouse and John Saxby, whose names stand as types for the apparatus they sponsored. The "Saxby" locking frame is a recognised technical term amongst railway men throughout the world, and "Westinghouse" suffices to describe the brake which is employed for the protection of trains on more than four-fifths of the railway mileage of the world. Always keep your eyes open and your wits alert. Always drive as you would wish others to driver. Always keep yourself and your vehicle in safe driving order. Learn, give and obey the recognised traffic signals. Obey the law, in letter and spirit. The remainder of the publication is given over to jolly enjoyable day tours North and South of the River Thames - ".. In fact, these tours will, by many motorists, be found so intensely interesting that once undertaken they will, no doubt, be repeated over and over again." Twelve possible routes are described in detail, with popular destinations such as Tunbridge Wells, Winchester, Eastbourne and Oxford all receiving a mention. Jolly good fun, perfect to keep Aunt Mable or Uncle Fred entertained for a few hours on a motoring excursion. Throughout the book there are subtle references to Westinghouse brakes, for example in an article discussing notably steep hills across the country, ".. on which Westinghouse Brakes will prove particularly useful ..". The centre pages are given over to an illustration of the company's vacuum servo braking system, and describes their various benefits. By 1927 we're informed that their servo installation had already been fitted to over 40 different makes of cars, including some famous racers, and was standard equipment on 12-24hp Citroens. The Westinghouse "Servo" system was recommended for most cars and also light commercials, whereas heavy vehicles were more suited to the Pressure Brake option. For this the power was derived either from a small air compressor, or from burnt gases in the engine's combustion chambers stored in a separate reservoir, ready to be called on whenever the brakes were required. For more articles on motoring ephemera and paperwork, please visit the Motoring Collectables section.